Here's a peculiar photo I took a few weeks back. I was having a nice scoop of sherbet at Joe's Ice Cream and was looking at the newspaper machines just in front of the establishment. 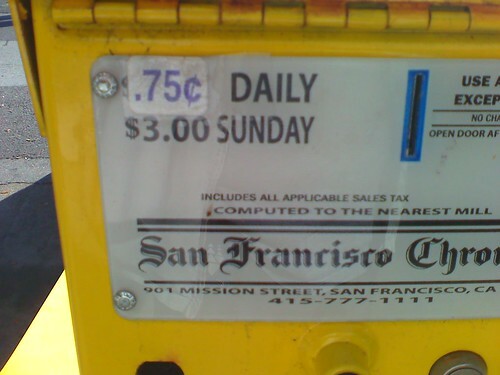 The Chronicle's yellow machine said the price of a Monday-Saturday newspaper is just ".75¢" which made me think about that price. .75¢ means 3/4 of one penny (or $0.0075); if you remove the dot, 75¢ means $0.75 or 3/4 of one dollar. If you seem confused, so was I. Here's an easier way to think of it: Let's say the sticker price on the machine said 1.75¢, then that would mean it would be one cent plus 3/4ths of a cent to buy a newspaper. Hmmm, I wonder if I cut a quarter of a penny and drop it in the machine, would I get a newspaper? Okay, it's just a fun question and blog post, and we all know it costs $0.75 to buy a paper, and the machine doesn't accept pennies. Even then, some crazed-up lawyer could think about suing the Chron for misleading customers by not selling the paper for the advertised price. I have a good eye to seek out fails! You might be interested in http://verizonmath.blogspot.com/, which is a tale about Verizon not knowing the difference between ".002 cents per kilobyte" and "$.002/KB." Their reps had a complete inability to understand the difference.